Matt Baker and Anita Rani are in West Cumbria where Matt takes a wild and bracing walk along a brand new section of the England Coast Path on Walney Island near Barrow. Matt Baker and Anita Rani are in West Cumbria where Matt takes a wild and bracing walk along a brand new section of the England Coast Path on Walney Island near Barrow. He meets the people who are creating the path, sees some incredible wildlife on route and discovers a local film-maker who's using materials foraged from the sea shore, to craft new and unexpected films. Meanwhile Anita heads to the north near Whitehaven taking a trail that explores the life of forgotten Cumbrian artist Percy Kelly. 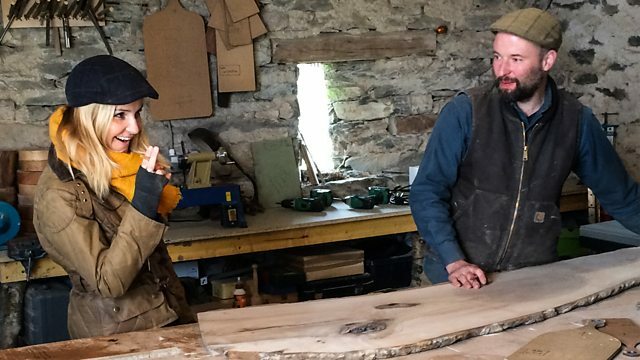 Helen Skelton is a few miles inland meeting the woodsman who gave up life in the city to return to his childhood home where he now handcrafts wooden chopping boards. Sean Fletcher is looking at how a fishing ban might just save England's only breeding colony of black guillemots. Tom Heap looks at how many people say they would pay extra to ensure the best animal welfare standards, but does that always prove to be the case when it comes to the supermarket till? And Adam Henson is on the estate in Wales where they've gone big into a type of livestock you won't find down on his farm - bison! Matt’s visiting Walney Island on the West Cumbrian coast to find out about England’s newest stretch of coastal path. Once completed it will be part of the longest coastal path in the world, stretching a staggering 2,700 miles. After getting his hands dirty helping with the path, Matt heads to South Walney Nature Reserve to find out about the island’s star inhabitants, a local seal colony that’s seen a huge increase in numbers. Local artist Percy Kelly’s paintings of Cumbria’s coast impressed Winston Churchill and a number of prestigious galleries. But he refused to sell a single picture and fame always eluded him. Other artists have painted the fells of the Lake District and Cumbria but Percy Kelly ignored the landscape and instead painted Cumbria’s industrial towns. Anita meets Percy Kelly expert Chris Wadsworth, who has developed six walking trails based on Kelly’s work. After learning about Kelly’s story and fascination with this stretch of coastline Anita meets Alan Roper, a modern day artist who finds inspiration in Kelly’s work. Shoppers often say that animal welfare plays a large part in their decisions, but the majority of pork sold in this country is the cheaper intensively farmed option. To find out why Tom goes to look at an intensive pig farm, it’s very rare to be able to film on farms like this, but it is how a lot of our pork is produced. So why is it that despite saying we will all pay more for higher welfare meat, when we get to the till we often don’t. Sean is taking in the coastline at St Bees Head and discovering how fishermen are working with conservationists to help protect some of our most important cliff nesting birds. After a spot of bird watching with the RSPB’s Dave Blackledge, Sean joins the crew of the local fishing authorities vessel to find out how a temporary fishing net ban around the cliffs of St Bees is helping to prevent bird fatalities during breeding season. On board Sean talks to scientist Mandy Knott to find out more about the ban and how it’s being implemented. Adam’s in Denbighshire in North Wales for lambing this week. There’s nothing unusual about a sheep farm in Wales, but sheep aren’t the only livestock here. Adam comes face to face with a herd of bison. They look impressive but can be quite dangerous, so he has stand back and take cover when they are let out to grass for the first time this year! Nestling in the beautiful surroundings of Winster and just off the beaten track from Lake Windermere is Jonty Hampson’s workshop and family home. In the workshop you can find Jonty and his best friend Kolli lovingly creating chopping boards and kitchen utensils, all by hand. After finding out about Jonty’s passion for carpentry and all things wood, Helen designs and makes her own chopping board, which isn’t as easy as it first looks. Here at Countryfile we’re used to filming Matt but on Roa Island on the Furness peninsula, our job’s taken over by someone else. Julia Parks uses 16mm film and has been experimenting with natural ingredients to develop her film and create pieces inspired by the Cumbrian landscape. Matt meets Julia on the beach to discover her newest ingredient, seaweed and her new darkroom, the beach! But of course every new film needs a premiere?